I love a snowy day. I love staying in my pajamas, sitting by the fire, and making a big batch of soup. But as the winter drags on and the calendar says it is spring, I get a little less enthusiastic for snow. And my kids are feeling the same. The usual excitement for snow and all the snowy activities is now met with disdain. We are ready for spring flowers, walks (the non-snowy kind), and putting away the snow gear. However, it is still cold. As in cold weather record-breaking. 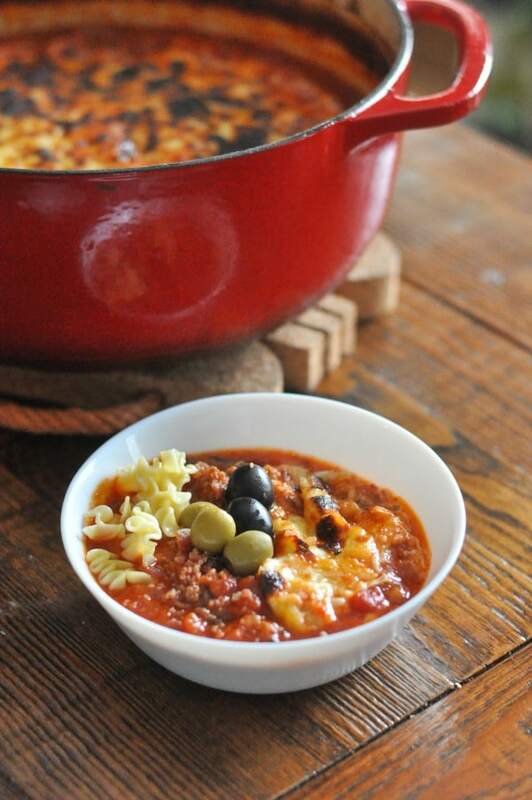 And when it is cold, I need comfort food and this Pizza Soup is the exact hearty soup I need when winter hasn’t gotten the memo that it is time to hit the road. 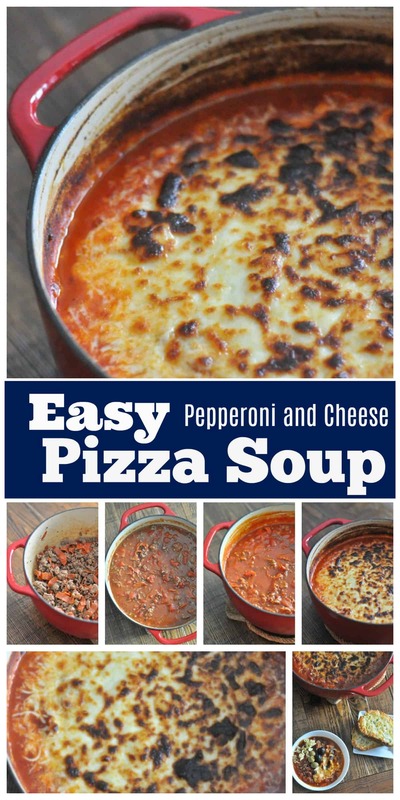 This Pizza Soup recipe is easy to prepare and the heartiness comes from Italian sausage, beef, and pepperoni. This soup is also super kid-friendly. My kids loved the novelty of “Pizza Soup” and it fit in super nice with my son’s Wacky Wednesday theme this week! I put all the toppings out and the kids picked how they wanted to top their soup. My tomato soup is their favorite soup but I think Pizza Soup has now become the favorite soup in our house! 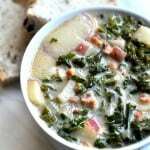 So if you are totally sick of winter, but you still need a hearty, delicious, and easy to prepare soup in order to keep warm, this soup is for you! 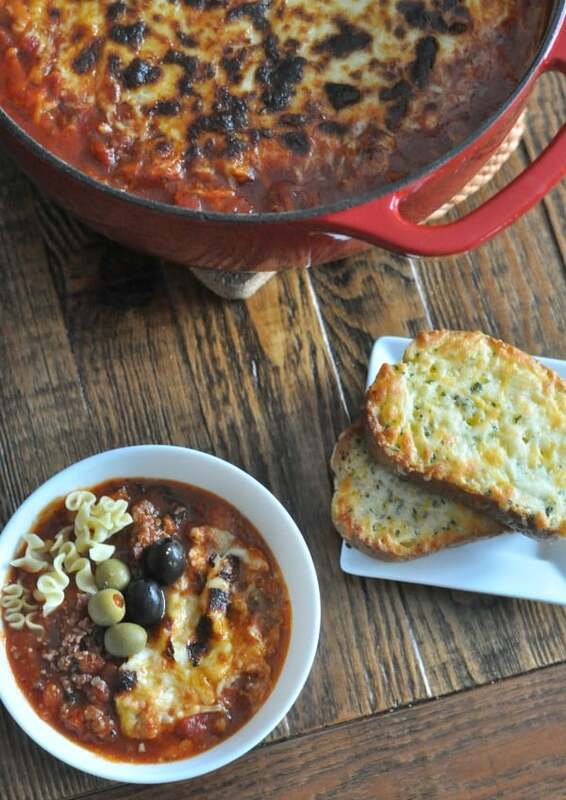 This Pizza soup is loaded with Italian sausage, beef, and pepperoni, and savory spices. 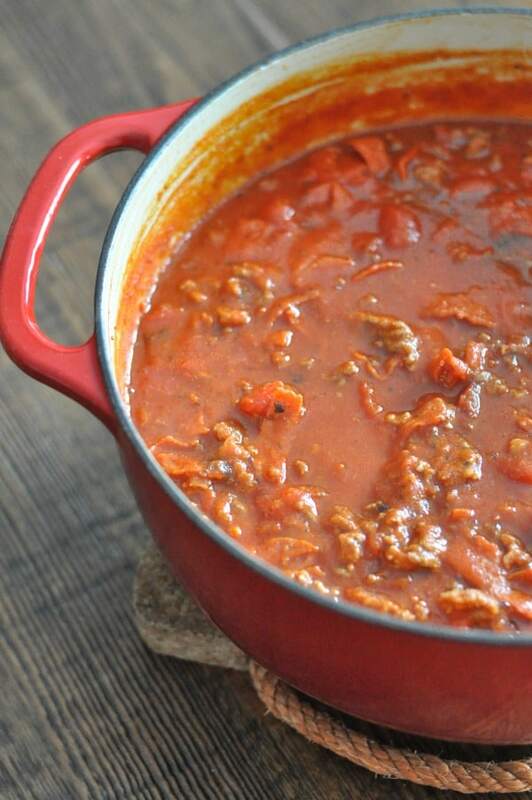 The base of the Pizza soup is a tomato soup and I love adding fire roasted tomatoes. Just a quick cook on the stove and the Pizza Soup is ready for cheese! I like to pop it under the broiler to get the cheese melted! 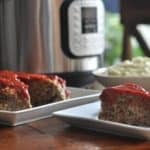 These are affiliate links for my favorite kitchen tools for this recipe. 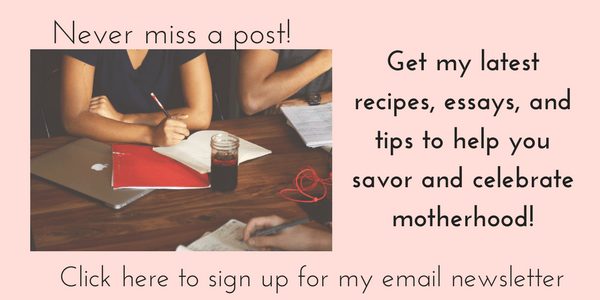 You can find all my recommended cooking and home products in my Amazon store too! 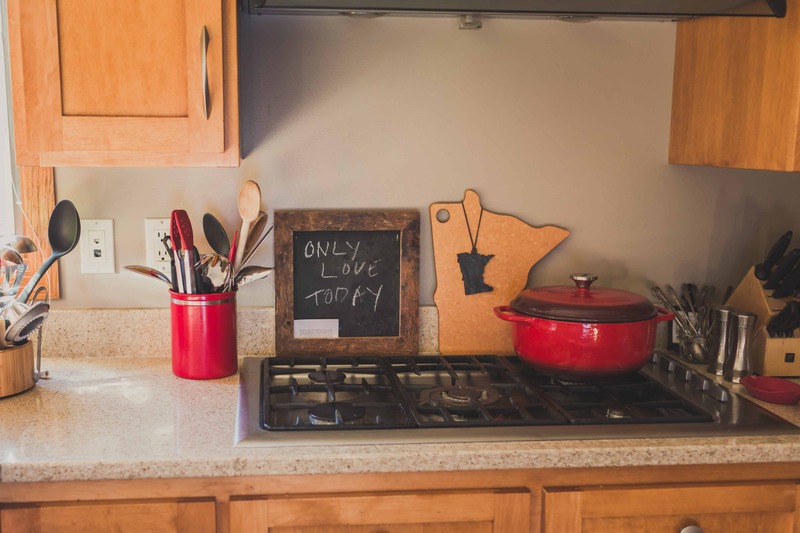 This is one of my very favorite kitchen tools and I love that it can go from stove to oven: Dutch Oven. This is my most used pan: Jelly Roll Pan I bake everything from cookies to garlic cheese bread. We like adding olives, cooked bacon pieces, and chopped peppers to our soup. You could also fresh basil or top with mini mozzarella or burrata cheese. My kids aren’t wild about mushrooms or onions but you could totally add these ingredients to the recipe! I love the cheesy crust on this recipe. 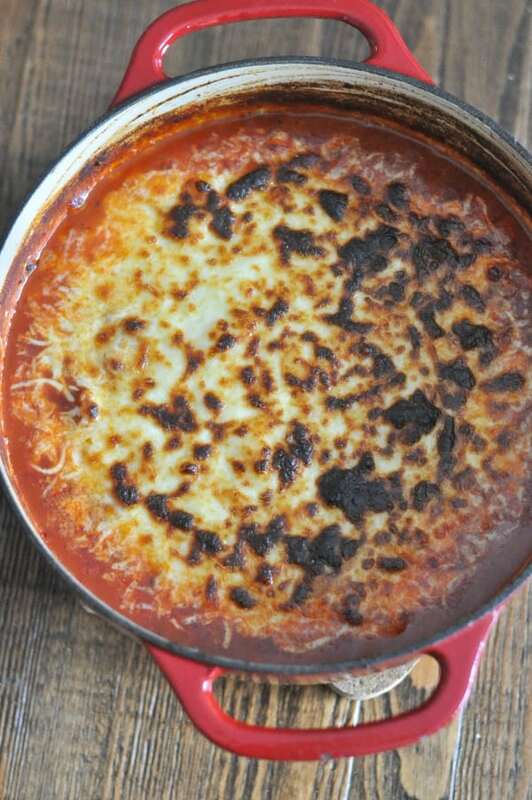 You can skip the broil step in the recipe, but I think getting that yummy cheese crust is totally worth it! 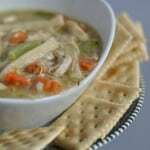 I like to serve pizza soup with cheese bread, breadsticks, or cooked pasta (malfada, rings, or fusilli are great pasta options for this soup). Here’s hoping winter doesn’t last forever, and spring takes its turn soon. 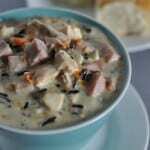 Until then, I hope you love this Pizza Soup recipe as much as our family does! 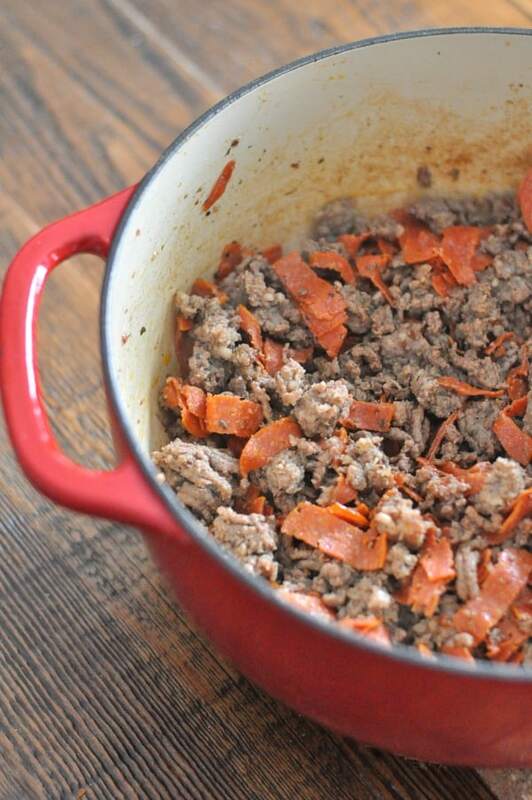 In a Dutch Oven, over medium heat, add ground beef, ground pork sausage, Italian seasoning, onion powder and garlic salt. Slice pepperoni into strips with a food scissors and add the pepperoni to the meat mixture. Cook until the meat mixture is browned and cooked. Then add diced tomatoes, crushed tomatoes, tomato paste, and chicken stock to the soup. Stir until combined. 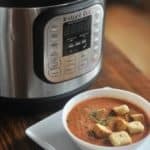 Bring the soup to a boil and cook for 10 minutes. Turn off heat. Add the grated parmesan then the shredded mozzarella to the top of the soup. I like to then put the soup into the oven to melt the cheese on top of the soup. I preheat the oven to broil and cook for 8-10 minutes until the cheese is browned. 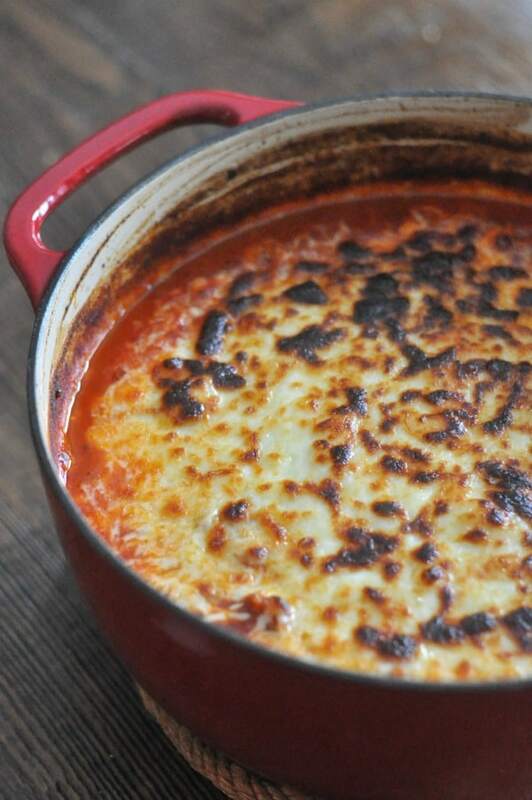 This step makes a nice cheesy crust on top of the soup. Check your pot to ensure it can go into the oven at a high temp (I use a Lodge Dutch Oven and broil no hotter than 500 degrees). 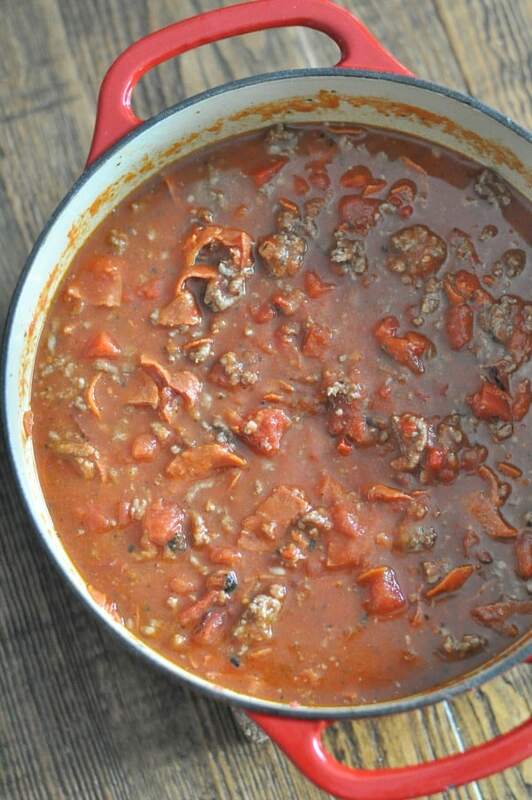 This entry was posted in Soup and tagged beef, italian sausage, pasta, soup, weeknight, winter by Alice Seuffert. Bookmark the permalink. This looks exceptional, Alice! 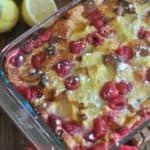 Love the broiled cheese topping idea.